Called Fish Skin due to it's ability to shed Water. Coat is made of Cotton and is coated with a Latex Paint. 2 sets of Buttons, 1 for walking and 1 for Riding. Available in Camel (shown) or Black. 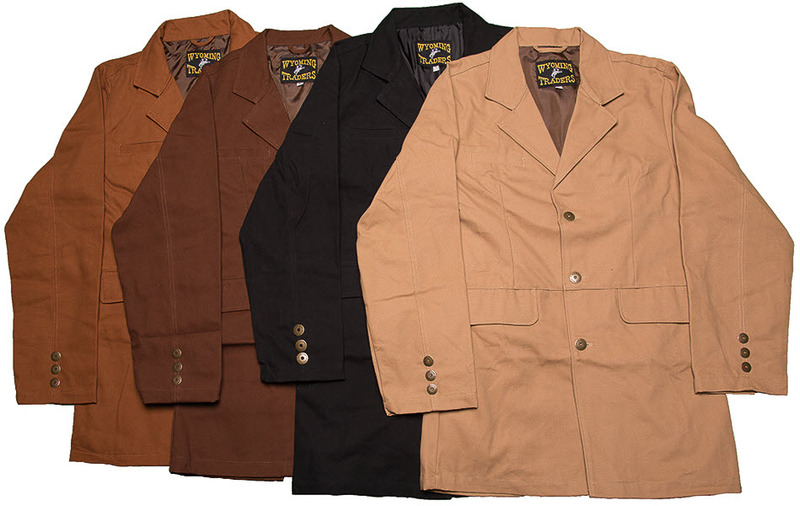 Cotton, Spanish styled VAQUERO JACKET in Buckskin, Brick Red, Black or Grey with contrasting Trim. 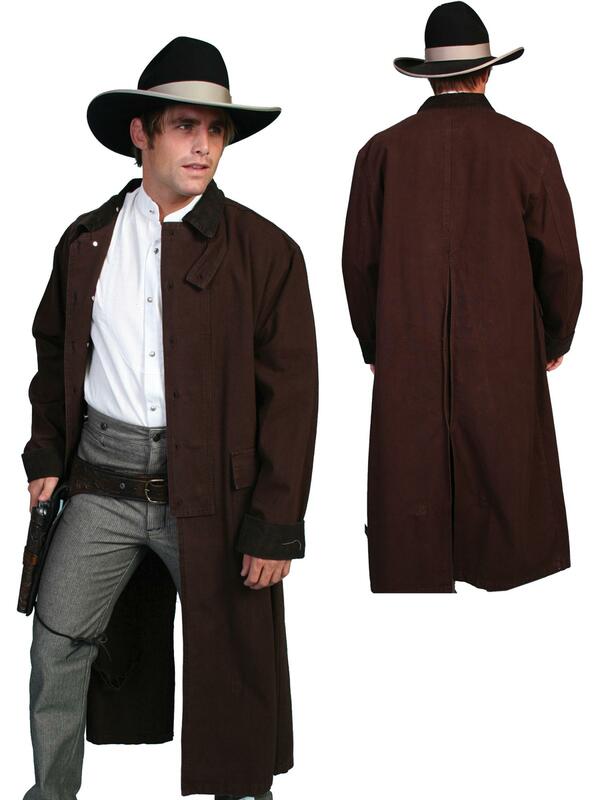 The TOMBSTONE FROCK is a Fine Quality Old West Garmet made from a Wool and Polyester Blend, this Coat is suitable for WEDDING WEAR or for Your Re-Enacting Costume. Fully lined with Correct Notched Lapels and Back, fabric covered buttons, one inside Pocket and hidden Pockets in the Tail. Available in Charcoal, Khaki, Brown. Driftwood, Grey or Black. 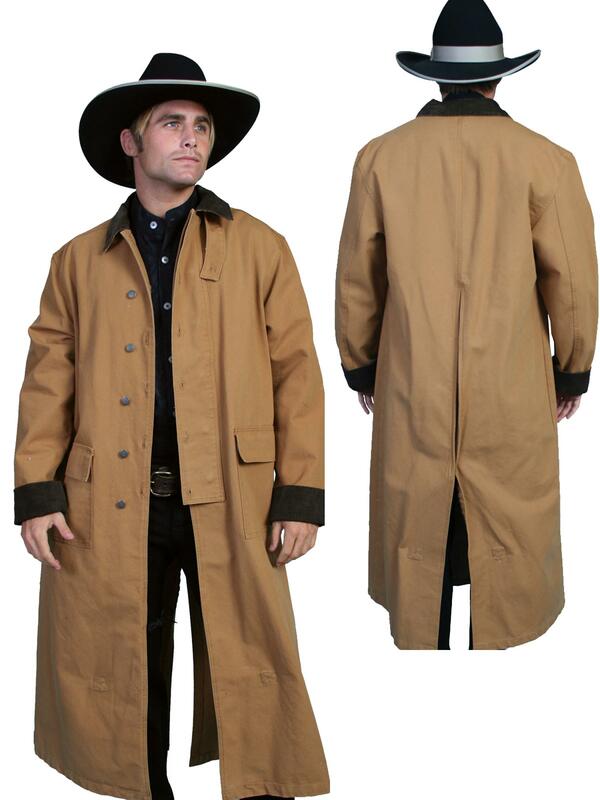 The RIFLEMAN FROCK is a Fine Quality Old West Garmet made from a Wool and Polyester Blend, this is a Full Length Coat Long enough to hide a Rifle or Scatter Gun under. 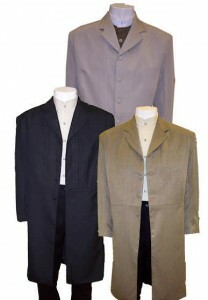 Coat is suitable for WEDDING WEAR or for Your Re-Enacting Costume. Fully lined with Correct Notched Lapels and Back, fabric covered buttons. Available in Black Only. 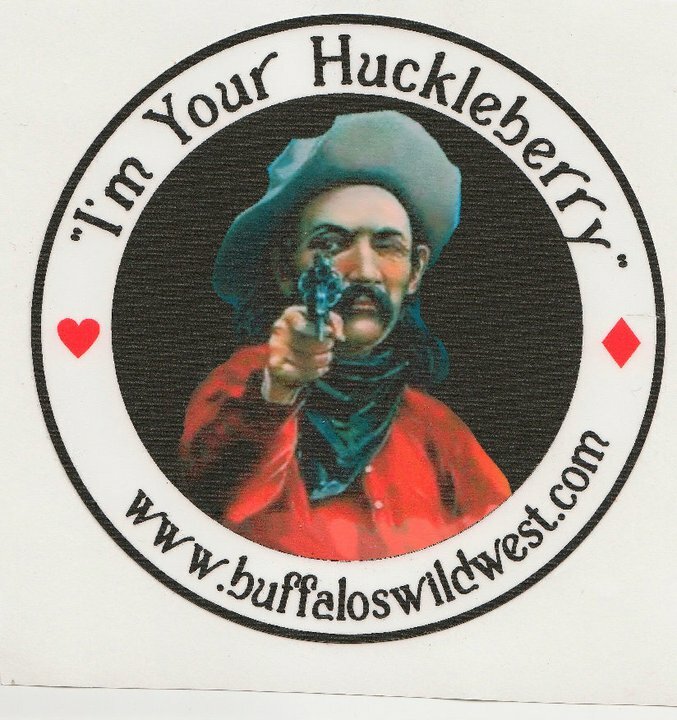 The GUNFIGHTER FROCK is a Shorter version of this Old West Garmet, mid-thigh length, un-lined and made of a High Quality Brushed Cotton Material. 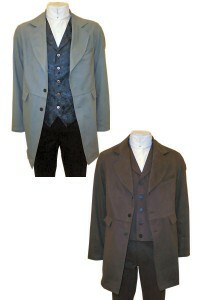 Coat is suitable for WEDDING WEAR, Everyday or for Your Re-Enacting Costume. 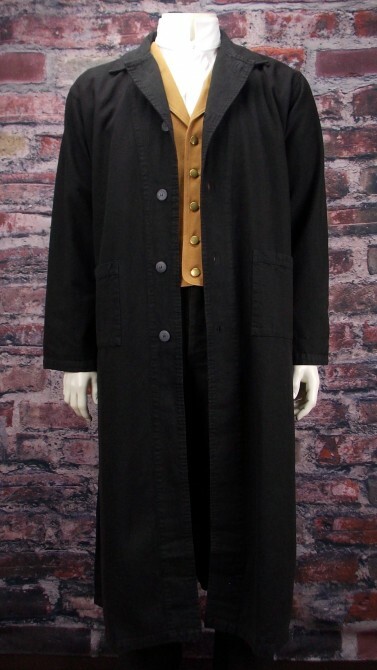 Coat has 2 Flap Pockets, Wide Notched Lapel and a Simple Vented Back that is Correct for a Town Coat of the Late 1800's till about 1920. Available Grey, Black or Chocolate Brown. Dry Clean Only. From "WYOMING TRADERS" The New CANVAS FROCK COAT is a Great alternative to the traditional Dress Coat, with it's Rugged Outdoors look. This Coat looks Great on the Marshal and just right in the Saddle. Coat is Fully Lined and made of 11 ounce Cotton Canvas with 2 flap Pockets and a Chest Pocket. Correct Lapels and Brass Buttons. Great for Everyday Wear or for Your Re-Enacting Costume. Available Black, Chocolate Brown, Tan or Cinnamon. 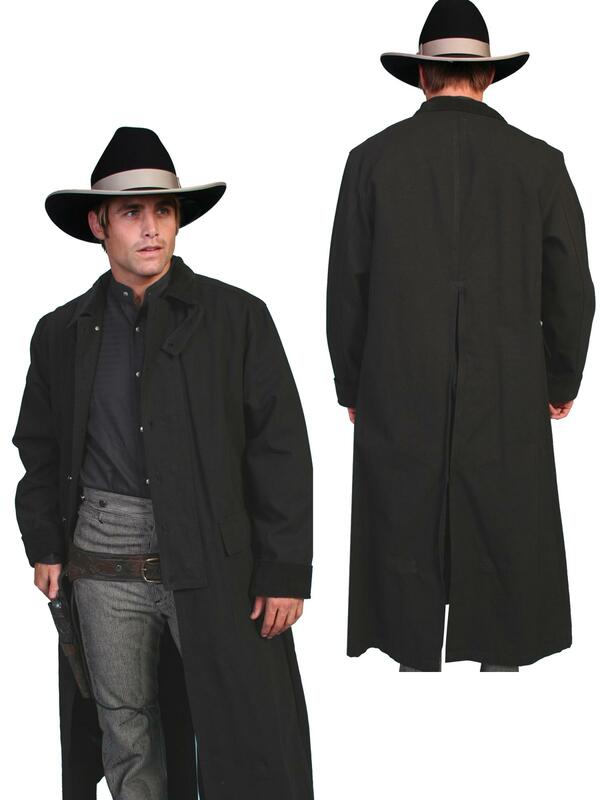 From "FRONTIER CLASSICS" The JESSE JAMES, Long Rider COAT is a Light weight Full length Coat with 2 Pockets and a Traditional Saddle Split in the Back. This Coat looks Great on the Marshal and Outlaws as well. Metal Buttons. Great for Everyday Wear or for Your Re-Enacting Costume. Available in NATURAL as pictured. NEW BLACK. 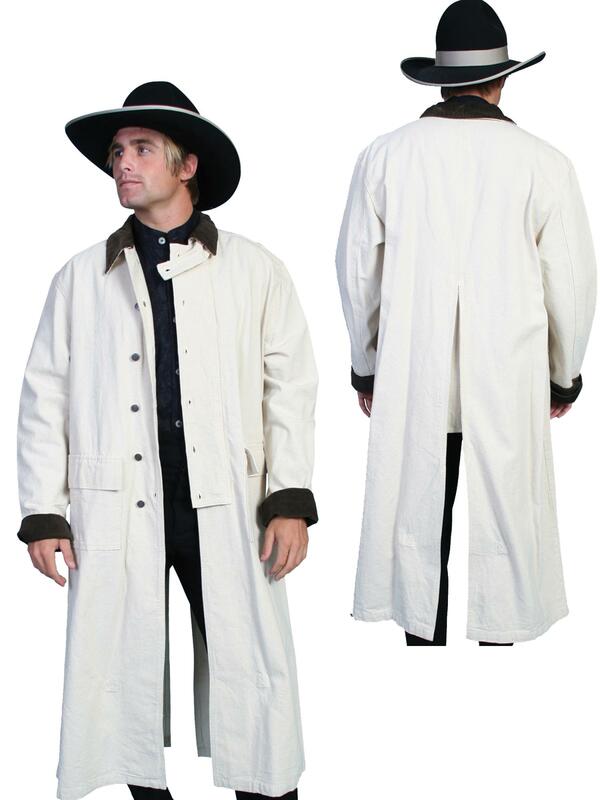 From "SCULLY RANGEWEAR" The Classic CANVAS DUSTER COAT is a Heavy weight Full length Coat with 2 Flap Pockets and a Traditional Saddle Gussett. This Coat looks Great on the Marshal and Outlaws as well. Metal Buttons. Great for Everyday Wear or for Your Re-Enacting Costume. Available in BROWN DUCK, NATURAL, WALNUT & BLACK.